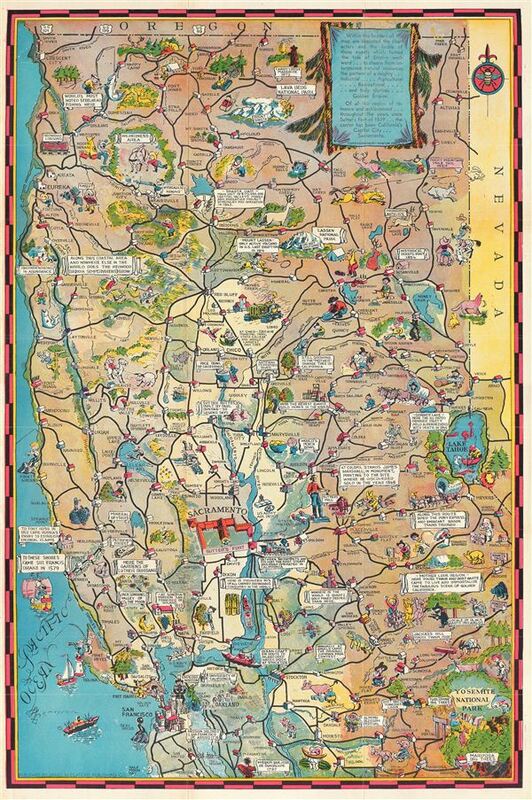 A curious and attractive 1939 Newton Pratt pictorial map of the Sacramento Valley. This map covers from the Oregon border south as far as San Francisco Bay and eastwards from the Pacific Ocean to Yosemite National Park. Historic sites and natural wonders are represented pictorially with curious anecdotal notations throughout. Cartoonish images focus on cowboys, wagon trains, hunting, farming, and fishing. The map was published by the James McClachy Company for the Sacramento Bee's Sacramento Guide Book. Newton Pratt (fl. c. 1930 - 1960) was an American comic artist active for over 30 years in the Sacramento, California area. Pratt's editorial cartoons were primarily published by the Sacramento Bee and McClachy Publishing. Pratt was known for his political cartoons which spanned both World War II and the Korean War. Today his work is highly prized by editorial comic collectors. Sacramento Guide Book (Sacramento: Sacramento Bee) 1939. Very good. Slight wear on original fold lines. Lower margin extended. Even overall toning. Accompanied by original 220 page Sacramento Guide Book bound in unbleached linen. Newberry Library, map2F G4362 .N6A6 1939 P7 (PrCt).